334 Commonwealth is located on the south side of Commonwealth, between Hereford and Massachusetts Avenue, with 332 Commonwealth to the east and 336 Commonwealth to the west. 334 Commonwealth was designed by architect George A. Avery and built in 1879-1880 by Vinal & Dodge, masons, and Charles F. Barton, carpenter, as the home of William Noble and his wife, Mary Jane (Green) Noble. He is shown as the owner on the original building permit application, dated November 14, 1879, and on the final building inspection report, dated October 12, 1880. It was originally numbered 332 Commonwealth until about 1889, when 328 Commonwealth was built and the houses to the west of it were renumbered. William Noble purchased the land for 334 Commonwealth on October 15, 1879, from lumber dealer David Nelson Skillings of Winchester. It was part of a tract of land he had originally purchased on December 16, 1870, as trustee for a trust composed of himself, Lawrence Barnes of Burlington, Vermont, Charles Whitney of Lowell, and David Whitney, Jr., of Detroit. The property subsequently had changed hands and he had re-acquired it, in his own name, on January 12, 1878. Click here for an index to the deeds for 334 Commonwealth, and click here for further information on the land on the south side of Commonwealth between Hereford and Massachusetts Avenue. By the 1880-1881 winter season, William and Mary Jane Noble had made 334 Commonwealth their home. They previously had lived at 77 Rutland Square. On July 10, 1886, William Noble transferred the property into his wife’s name. William Noble was a hardware dealer in partnership with George Allen.. In August of 1886, the firm of Allen & Noble filed for bankruptcy and its assets, and those of the partners, were assigned to Theophilus King and William H. West for the benefit of their creditors. The claims apparently were settled, and on March 30, 1887, Theophilus King and William West released their interest in 334 Commonwealth to Mary Ann Noble. The Nobles continued to live at 334 Commonwealth during the 1891-1892 season, but moved thereafter to Brookline. On March 21, 1892, 334 Commonwealth was acquired from Mary Jane Noble by boot and shoe dealer Francis Faulkner Emery. He was a widower, his wife, Caroline Sweetser (Jones) Emery, having died in October of 1890 while they were living at 17 Union Park. He purchased 334 Commonwealth as trustee of a trust he established for the benefit of their three adult children: Maria Sweetser Emery, Francis Faulkner Emery, Jr., and Edward Stanley Emery. Maria Emery probably lived at 334 Commonwealth with her father. Edward Emery had graduated from Harvard in 1887. After working in his father’s boot and shoe business for several years, he had moved to Spokane, Washington, where he purchased a ranch. He married in June of 1893 to Charlotte Mortimer White. They returned to Boston in June of 1896 and lived at 334 Commonwealth with his father while he studied at Harvard Medical School. Francis Emery, Jr., was associated with his father’s boot and shoe firm and lived at 334 Commonwealth with his father. He married in October of 1894 to Jessie S. McIntosh. They probably lived briefly at 334 Commonwealth after their marriage, but by March of 1897 were living on a ranch in Spokane, possibly having moved to Edward Emery’s ranch when he came east to medical school. Francis Emery, Sr. died in January of 1897. On March 24, 1897, Francis Emery, Jr., sold his one-third interest in 334 Commonwealth to Dr, Herbert Codman Clapp, and on April 2, 1897, Dr. Clapp purchased the remaining two-thirds interest from Maria Emery and Edward Emery. He and his wife, Mary O. (Richardson) Clapp, made it their home. They previously had lived at 11 Columbus Square. Herbert Clapp was a homeopathic physician and also maintained his office at 334 Commonwealth. The Clapps continued to live there during the 1908-1909 winter season, but moved thereafter to Brookline. On June 11, 1909, 334 Commonwealth was purchased from Herbert Clapp by merchant tailor and wool dealer William H. Sullivan. He and his wife, Margaret T. (Cleary) Sullivan, made it their home. They previously had lived in an apartment at 308-310 Commonwealth. On July 1, 1909, he transferred the property into his wife’s name. It is unclear whether the original house actually was razed or rather was significantly remodeled. The Building Department records contain no information from the period, and Bainbridge Bunting’s Houses of Boston’s Back Bay does not indicate that the house was replaced or remodeled. The façade of the post-1909 house clearly was updated, with sandstone at the first story and brick above. The overall massing and configuration of the façade, however, is similar to 336 Commonwealth, designed by George Avery and built at about the same time, which would imply remodeling of the original structure. The work had been completed by May of 1910, when William and Margaret Sullivan were shown as being in residence in the 1910 US Census. They continued to live at 334 Commonwealth during the 1930-1931 winter season, but moved thereafter to an apartment at 180 Commonwealth. They also maintained a home in Atlantic, Massachusetts. On June 15, 1931, the Massachusetts Hospital Life Insurance Company foreclosed on a mortgage given by the Sullivans and took possession of the property. The house was not listed in the 1932-1937 Blue Books and was shown as vacant in the 1932 and 1933 City Directories. On August 7, 1933, 334 Commonwealth was acquired from Massachusetts Hospital Life Insurance by Edwin Robin Huffam, a motor inspector for an express company. He was unmarried and lived at 414 Massachusetts Avenue. By 1934, 334 Commonwealth was the home of Clarence B. Benedict, a salesman, and his wife, Millicent E. (Thompson) Benedict, a medium, who operated the Church of the Congress for Wisdom. They previously had lived at 414 Massachusetts Avenue. Millicent Benedict died in July of 1935. By 1936, Clarence Benedict had moved to 110 Cummington. The house was shown as vacant in the 1936 City Directory. On July 2, 1936, Edwin Huffam transferred the property back to Massachusetts Hospital Life Insurance, which held the first mortgage on the property. On August 3, 1936, 334 Commonwealth was acquired from Massachusetts Hospital Life Insurance by Kate D. (Byer) Goldberg, the wife of attorney and real estate investor Maurice Eli Goldberg, as trustee for their two children, Richard Huntley Goldberg and Barbara Grace Goldberg. They lived in Rockport. In August of 1936, Maurice Goldberg applied for (and subsequently received) permission to convert the property from a single-family dwelling into three apartments. 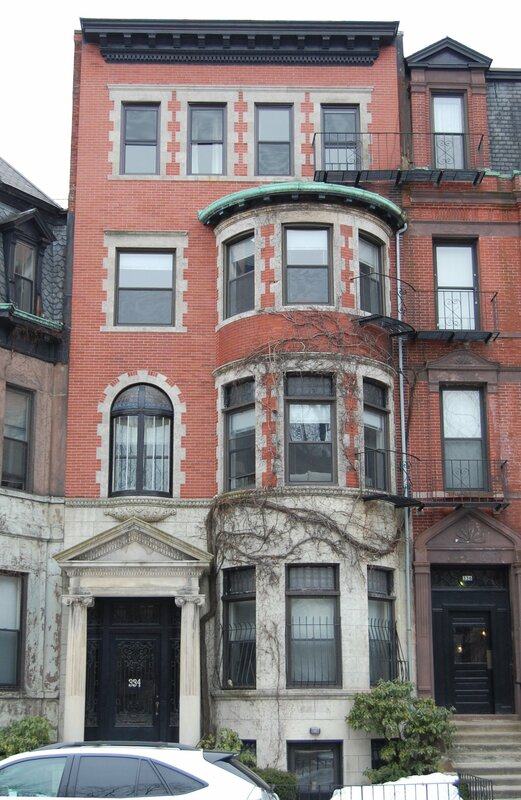 After the remodeling was completed, Maurice and Kate Goldberg lived in one of the apartments until about 1941, when they moved to an apartment at 207 Commonwealth. They also continued to maintain their home in Rockport. 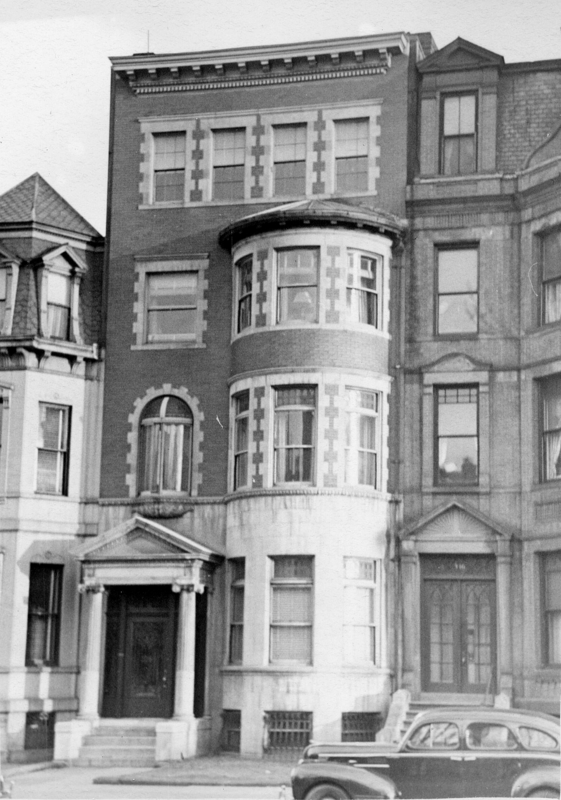 On March 4, 1940, the Supreme Lodge of the New England Order of Protection foreclosed on a mortgage given by Kate Goldberg and took possession of the property. On July 16, 1945, 334 Commonwealth was acquired from the Supreme Lodge of the New England Order of Protection by Earle Glendon Weston and his wife, Helen G. (Clark) Weston. They lived in one of the apartments. They previously had lived at the Farragut Building at 126 Massachusetts Avenue, where he was superintendent. In June of 1947, the Westons applied for permission to convert the property from three apartments into five apartments. They subsequently abandoned the application but, based on the City Directory entries, nevertheless appear to have increased the number of units to five. On July 23, 1954, they transferred the property into her name. At about the same time, they moved to Brookline. On August 28, 1957, 334 Commonwealth was acquired from Helen Weston by Anthony Hicks Brackett and his wife, Katharine (Conner) Brackett. He was treasurer of the Ames Linen Company. They lived in Chestnut Hill. On July 29, 1958, 334 Commonwealth was acquired from the Bracketts by Dr. Jean Mayer and his wife, Elizabeth (Van Huysen) Mayer. He was a professor at the Harvard School of Public Health and later would become president of Tufts University. They lived in Sudbury. On December 27, 1960, 334 Commonwealth was acquired from the Mayers by Jack Aifer. He subsequently acquired 328-330 Commonwealth, 336 Commonwealth, and 344 Commonwealth. 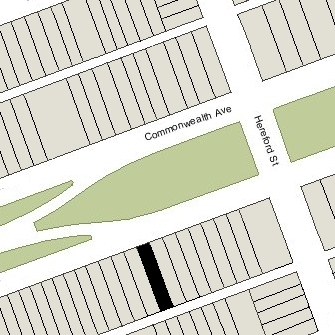 On May 4, 1967, Robert White acquired 334 Commonwealth and Jack Aifer’s other four houses on the block. He already owned 324–326 Commonwealth and 348 Commonwealth. By December of 1978, he owned 322–324–326–328–330–332–334–336 Commonwealth, 344-346-348–350 Commonwealth, and 354–356–358–360 Commonwealth. In December of 1988, he applied for (and subsequently received) permission to convert 334 Commonwealth from three apartments into eight apartments. At the same time, he also applied for (and subsequently received) permission to combine it with 322-332 Commonwealth into one property with 63 apartments, to be known as 322-334 Commonwealth. 336 Commonwealth remained a separate property. 334 Commonwealth remained an apartment house in 2018.